With its offices sporting wood flooring, a roof painted bright orange and conference rooms named after target markets in Southeast Asia, AppWorks, one of Taiwan’s few startup accelerators, has the look and feel of the American counterparts it’s modeled on. But its founder, Jamie Lin, 37, does not sound much like the optimistic entrepreneurs in Silicon Valley. Instead, he is glum about the future for Taiwan’s tech industry. “It’s like you’re riding on the Titanic, and you know it’s going to hit an iceberg, and you’re trying to turn the rudder, but you know it’s not turning fast enough,” he said in a recent interview. Five years ago, Taiwan’s tech industry was riding high. The device maker HTC had surpassed Apple to become the largest smartphone vendor in the United States, while the computer company Acer had leapfrogged Dell to become the world’s second-largest personal computer maker. Such successes helped lift Taiwan’s economy, building on the country’s longtime work on computer chips and moving the island nation into its next phase as a tech power. That trajectory has turned. Last year, share prices of the computer makers Acer and Asustekplummeted 43 percent and 22 percent as the PC market sagged, while HTC plunged 45 percent. Taiwan electronics exports have been falling since February 2015, and in the third quarter the country’s gross domestic product contracted partly because of weakness in the tech sector. As voters went to the polls and elected a new president over the weekend, a rare point of agreement between Taiwan’s fractious political parties was that the tech industry needs help. Just days before the election four years ago, major Taiwan tech figures took to television to argue that the policies of the incumbent president, Ma Ying-jeou, of improving relations with China would lift the industry. Yet rising competition from Chinese manufacturers and slowing growth there have had a mixed impact on Taiwan tech since. With the Democratic Progressive Party’s Tsai Ing-wen – who won a decisive victory Saturday- vowing to renew Taiwanese innovation and build out a new tech hub here, a crucial part of Taiwan’s immediate political future depends on whether it can be turned around. Taiwan’s tech problem, as Lin sees it, is the result of a culture and government that have failed to generate the talent and flexibility to move beyond the manufacturing prowess that made the island a tech hub in the 1980s and 1990s and forward to the software and Internet industries driving Silicon Valley’s current boom. The dilemma became apparent to him in 2009 when he saw a commercial forApple’s iPhone. Taiwan’s tech industry is rooted in a conservative business culture built around a now-aging first generation of high-tech industrialists, critics said. Unlike Silicon Valley, which has 31-year-old Mark Zuckerberg of Facebook, and China, which has the 44-year-old founder of Tencent, Pony Ma, Taiwan’s tech leadership includes Morris Chang, 84, of the chipmaker Taiwan Semiconductor Manufacturing Corp., and Terry Gou, 65, the founder of Foxconn, the Taiwan-based contract manufacturer. That has solidified a “survival mentality” unsuited to innovation, with tech executives unwilling to spend on the marketing and design that could set their firms apart from competitors, said Willy Shih, a professor at Harvard Business School who studies Taiwan’s tech companies. One example of that philosophy was on display recently at Silicon Power, which produces branded portable hard drives and USB drives. When the company, based in the affluent riverside neighborhood of Neihu in Taipei, received a flood of orders ahead of Christmas last year, it sent employees responsible for marketing, design and sales – all key to building a brand – to the factory floor, according to one employee, who declined to be named because he was not authorized to speak about the policy. Some of Taiwan’s larger tech companies have suffered from a similar philosophy. HTC did not put enough emphasis on branding, Shih said, adding that Acer failed to adequately transfer to mobile devices as the personal computer market sagged. Many of the Taiwanese companies are now beholden to bigger branded companies, mostly in the United States, for computers, servers and smartphones. Acer and HTC did not respond to requests for comment. Nick Wu, the chief financial officer of Asustek, said the company anticipated the shifts in the industry and was working to expand into robotics, as well as computing devices for the home and car. 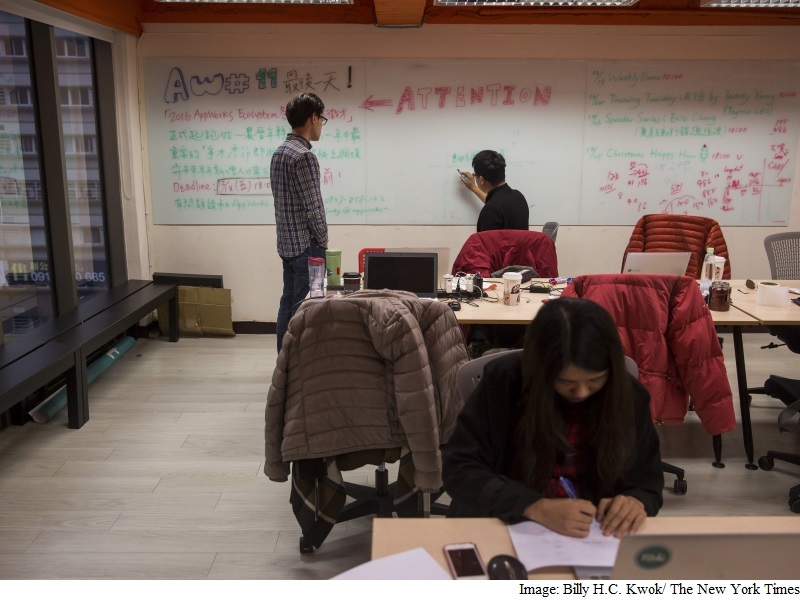 Taiwan’s entrepreneurial scene, meanwhile, is growing but remains small. Many of those trying to start new companies said they had often run into the conservative mindset that shunts younger people into risk-averse positions at established companies. Entrepreneurs also have to grapple with a maze of regulations that have restricted online payment platforms and limited tech startups’ ability to list in Taiwan. Lin of AppWorks recalled a moment last year when he and four others in the tech industry met with 30 legislators to work on a law to regulate online payments like PayPal. Of the legislators in the room, only a few had ever used any form of online payment platform. Some organizations are working to jump-start the tech industry. Taiwan’s Industrial Technology Research Institute, or ITRI, a government-sponsored group that supports and builds out new tech companies, recently began spinning off more companies early, whereas before it had been doing more to aid extant firms, according to a general director, Stephen Su. The institute is also spearheading an initiative to link Taiwanese companies and offer their services to hardware startups in places like Silicon Valley that are in need of quick prototyping and manufacturing, with the aim of bringing in new business from the United States. And the organization has created a research group to work on regulatory problems. Anita Huang, the head of Taiwan Startup Stadium, an initiative started by the government to lift startup funding and training, said there was a need for more role models to show the way for aspiring entrepreneurs. She pointed to one of Taiwan’s best-funded startups, Gogoro, as an example. Co-founded in 2011 by Horace Luke, a former HTC executive, Gogoro has raised $180 million (roughly Rs. 1,218 crores) and produces scooters powered by replaceable batteries stored at stations around Taipei. The company grew to more than 600 employees in 2015, up from 15 in 2011. Luke said his goal was to avoid relying on larger companies and to build a platform by offering services and devices based around the replaceable battery stations. Because of his strong local reputation, Luke said he had been given freedom by investors to run the company as he wanted. He said he encouraged employees, many of whom are under 40, to shun short-term considerations in favor of longer-term innovation.